Since April Fool’s Day this year most of Japan has been able to enjoy digital TV broadcasts created specifically for mobile devices, particularly for cellphones. The new service has been branded “1-seg” for a very good reason. The bandwidth occupied by one regular broadcast digital channel has been divided into 13 parts in much the same way as is practised around the world. However, one segment (1-seg) of each digi channel in Japan is used for exclusively mobile content. Currently, there are seven such dedicated TV channels under the 1-seg banner. At a recent test viewing I was pleasantly surprised to find an image quality that is much better than mobile analog TV. The video format is H.264, the size of the image is 320 x 160 dots and the signal broadcasts 15 frames per second. Moreover, the mobile phone screen can be split to view TV, subtitles and data streams, such as news tickers, separately. 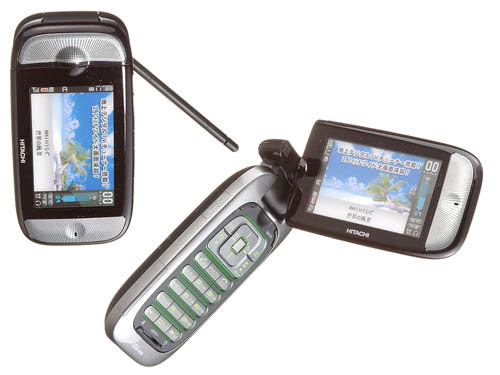 Up to 30 minutes of programming can be recorded and stored in the phones. Before launch the development of the chips needed to handle the reception and conversion of the digital broadcast signals took a long time. The challenges were centered on resolving the heat and power consumption problems associated with packaging these smart technologies on a single chip small enough to fit in a phone. As for the cellphones currently available, au and DoCoMo have launched three 1-seg phones between them. DoCoMo introduced the P901iTV by Panasonic, while au sells two phones, the W41H from Hitachi and Sanyo’s W33SA. In June, Vodafone will introduce the V905SH 1-seg phone from Sharp. On the downside, this digital TV functionality comes with a weight premium: generally the phones weigh around 150g. Also, the batteries are good for only three hours of TV watching, which is borderline acceptable. Away from cellphones, another target market for mobile TV is the in-car addict. Car navigation units in Japan have large screens and viewing analog TV is already a highly popular activity for those millions of Japanese enjoying their weekends in traffic jams. Adding 1-seg to the mix already looks like a winner. Whatever the viewing platform, digital broadcasting also has a few small problems before it gains widespread acceptance. Flipping between channels is slower than with analog TV, plus processing of the broadcast signals takes a few seconds. This might not sound like a problem but try watching live sports in the neighborhood of an analog TV or radio showing the action real-time. Will mobile TV become a success? Content must be adapted for the smaller screens of mobile phones and the programs must be shorter to keep viewers’ attention, since their mobile TV time will already be divided between a myriad of other newly multitaskable distractions. In the all-important financial realm, 1-seg will be a good medium for commercials and infomercials, as additional information on products or services can be send through the data channel. By clicking a link, the viewer can browse to advertisers’ websites and start shopping right away. Eventually, sporting events will also be highly popular on 1-seg, allowing viewers to browse for stats and background information. Lastly, it’s only a matter of time before the interactive elements, such as voting, we already associate with regular digital television hits the small screen, providing a whole new way to waste time on the go.